Pierre is a fourteen year old lover of crime novels and I got to thinking that in fact the Kimi books were indeed crime novels – albeit with a mix of fun and fantasy. In Kimi’s Secret, Kimi must discover who comitted murder and in the sequel Kimi’s Fear she’s put on trial and must battle to prove her innocence. So I set Pierre a mission: to read both books one after the other and to let us know what he thought. I am a fourteen-year-old boy and was a bit reluctant to read these books as I usually prefer crime novels, but after starting the first one, I was amazed at how much of a page-turner it was. Kimi’s Secret is an easy to read book, for any age, its plot takes plenty of twists and turns and still manages to keep you captivated at the end of every sentence. We meet Kimi Nichols from a small Cornish village called Mousehole (which I was amazed to find is a real place!). If being thrown into a strange magical place isn’t tough enough, being attacked by a flock of crows should just about top it off. The writer takes everything you know, makes it wobble and turn inside out. Magic is mojo, monkeys are the fuzz and fairies have become famoose. 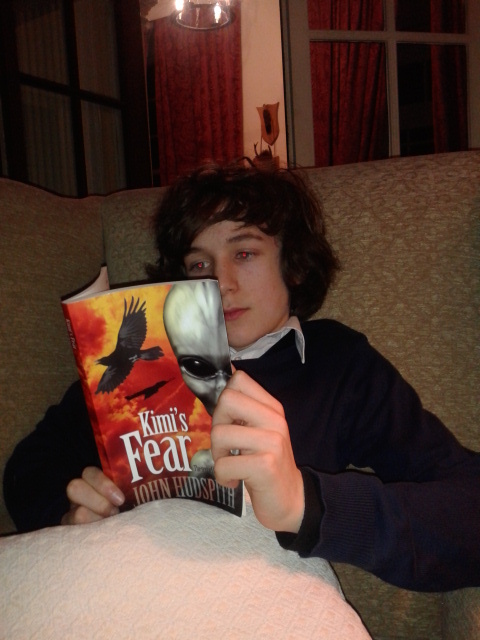 In the sequel Kimi’s Fear, we pick up the action a year after where we left off and Kimi’s life is still as exciting as ever; from being hunted by hybrid aliens to taming her ultimate fear. This book should keep you up at night, not just wanting to read more, but fearing every shadow in your room. Even with all this, the books still manage to keep their pace. It’s easy to resort to clichés but these books are full of original ideas. Both Kimi books are excellently written and I could not recommend them highly enough.